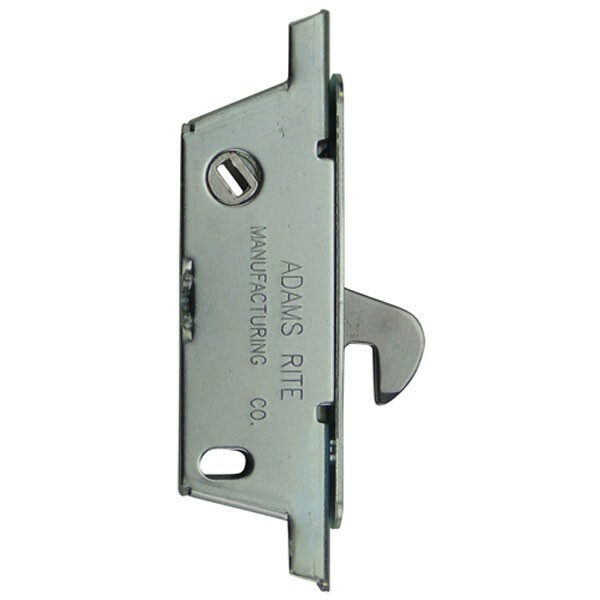 The Adams Rite MS® 1848 Deadlock & accessories are designed to fit within very narrow stile sliding door stiles without compromising the high degree of security needed by these doors. Can be operated from either side by any standard bored type cylinder (Adams Rite part reference 8426) or Adams Rite 1000 series turn. Please note the strike plate is not included and must be ordered separately. Suitable for use on aluminium and timber sliding patio doors. The bolt can be adjusted by 4.5mm to compensate for door and frame mis-alignment by shortening the bolt projection by turning an exposed screw in the face of the lock. This can compensate for a considerable misalignment between door and jamb. The three ply laminated stainless steel hookbolt is designed to withstand approximately one ton of the force vertically or horizontally, thus protecting against lifting attacks on sliding doors. This self latching version has a spring-loaded hookbolt which will retract immediately on contact with strike to prevent damage.